This Greek theatre mask of the Guard or Sentry possesses qualities of mirth, laziness and gluttony. This character in search of promotion provides the information that starts a cascading series of events that lead to the suicidal death of Eurydice, Haemon, the death of Isemene and so many more. It’s Greek Tragedy. Everybody dies in the end. 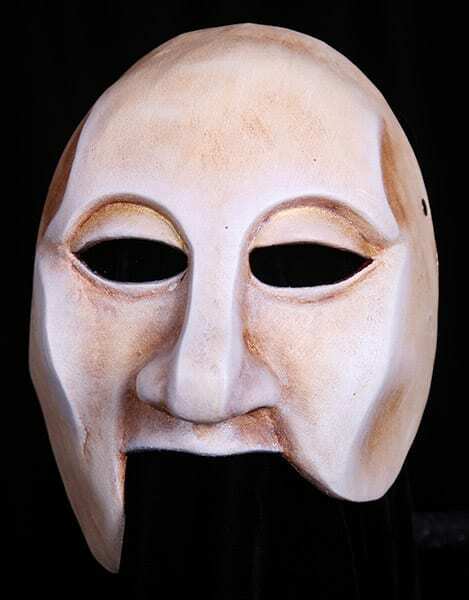 Unlike many of the other masks in the Greek theater series this particular mask could be used in the Greek Comedies as well. This half mask is made of neoprene, has an adjustable strap and is padded at the back for comfort.